We're experimenting with an Environmental Book Club logo. It may be changing, so don't get attached. 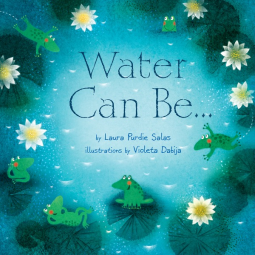 This week I'm directing you to the blog Picture Books Help Kids Soar where earlier this month Vivian Kirkfield reviewed Water Can Be by Laura Purdie Salas. You'll find an excerpt, synopsis, and a list of ways it can be used. Oops. Thanks for that. I just embedded the link in the post.